Officers have been victimized due to their misperceptions of offenders. In fact, a groundbreaking study identified this as the primary reason law enforcement personnel were feloniously assaulted.1 Such incidents can result when officers encounter a compliant subject and then lower their guard. Likewise, offenders form perceptions of law enforcement personnel they encounter, which influence the decision whether to assault an officer. 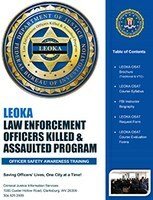 The FBI’s Law Enforcement Officers Killed and Assaulted (LEOKA) Program conducted three studies over a 20-year period: Killed in the Line of Duty (1993), In the Line of Fire (1997), and Violent Encounters (2006).2 The research examined offenders who had feloniously assaulted police officers. Killed in the Line of Duty and In the Line of Fire explained that no clear profile exists for such subjects. Violent Encounters noted that some offenders had prior criminal records, some had psychiatric histories, and others could not be categorized. Many subjects were affiliated with gangs, more were exposed to violence at an early age, and most abused alcohol and other drugs. Regarding individuals who might assault or kill an officer, the research concluded that it could be anyone. Despite the lack of a profile for violent perpetrators, the research offered insight into the offender mind-set. In the Line of Fire noted that 33 percent of subjects who feloniously assaulted officers stated their assaults were premeditated and intentional. The study also observed that 64 percent of offenders who assaulted officers stated their assaults were impulsive, unplanned, or opportunistic. A former instructor with a major influence on the development of the LEOKA Program offered this perspective regarding the data: “One-third of the offenders say they are coming after the officer no matter what. The other two-thirds, they are looking for that ‘window of opportunity,’ waiting for the officer to make a mistake.”3 In other words one-third of subjects will attack without hesitation, but two-thirds will wait until they perceive their assaults will be successful. An example graphically illustrates the mind-set of a “one-third offender.” In the early morning hours in a rural area, a lone officer stopped a subject for a speeding violation. He followed proper police procedure during his approach. The officer used a flashlight in his nonweapon hand while leaving the other hand free. He wore body armor and positioned himself at the center post of the vehicle. As the officer began contact with the driver, shots rang out. The officer disengaged and drew his weapon while moving to the rear of the suspect’s vehicle for cover. The officer returned fire, and the offender quickly drove off. Body armor worn by the officer stopped two rounds, and the offender later was apprehended without incident. The officer was at a disadvantage, unaware that the driver was operating a stolen vehicle and in possession of a stolen weapon. When interviewed, the offender stated that he intended to kill the officer. He perceived the officer as a “professional type,” the kind who would wear a vest. The subject admitted to adjusting his point of aim to the officer’s neck because of the potential for body armor. Despite the offender’s intent to kill, he dealt with a professional police officer who maintained a tactical advantage. The offender still attacked, unsure whether he would be successful. Mr. James J. Sheets is a former police lieutenant and an officer safety awareness training instructor with the FBI’s Law Enforcement Officers Killed and Assaulted Program. “Two-thirds offenders” are not as committed to assaulting an officer unless the opportunity presents itself. Their perception of the officer and the circumstances are critical determinants when considering a potential attack. One offender described two separate stops by different officers and why he attacked one but not the other. His description of events provided insight into the mind-set of the two-thirds offender. Wanted for a felony warrant, the subject was stopped for a speeding violation. The offender stated the officer made direct eye contact with him in the side mirror, maintained visual contact, touched the trunk, and visually inspected the rear passenger area. The offender stated he perceived the officer as professional and attentive. The subject concluded he could not retrieve the weapon under his seat without getting hurt; therefore, he did not attack this officer. Stopped again in a similar set of circumstances, the offender described the second officer as inattentive. Perceiving this vulnerability, the offender attacked the officer, shooting him several times and seriously wounding him. Officers must be aware that their nonverbal messages can influence a violent offender. Two of the authors of the previously mentioned LEOKA reports suggested a casual attitude may lead an offender to believe that the officer is mentally or emotionally distracted.4 If an officer does not follow an offender’s body movements, hand movements, or shifts in body position during contact, the subject may perceive that the officer lacks a readiness to act. Much like officers assess offenders for threat potential, subjects also assess officers for vulnerabilities. Research suggested that training and adherence to proper police procedures are critical to mitigating officer attacks. Trainers and supervisors should work together to assist officers in developing behaviors that project a professional police image. Violent Encounters explained that trainers should teach officers to be vigilant, attentive, and mentally prepared to effectively respond to constantly changing situations. The study further noted that trainers should advise officers never to judge individuals on physical characteristics alone. Research recommended that supervisors ensure officer compliance with departmental policies and safety procedures. Following law enforcement training and adhering to safety procedures enable officers to enhance their safety by overcoming the possibility that offenders perceive them as vulnerable or weak. Offenders assess officers during every contact. No clear established profile exists of a subject willing to commit violence against a police officer. The research suggested that of those who have feloniously assaulted police officers, one-third of these offenders possess the mind-set that they will attack an officer regardless of their perceptions of the officer. Two-thirds of the offenders will attack an officer when they perceive their attack will succeed. Officers should strive to maintain a professional image that sends a nonverbal signal to offenders that the officers are alert and attentive. Violent Encounters examined the profile, mind-set, and perceptions of offenders who have feloniously assaulted police officers. Based on the study, the researchers have developed a technique for officers to mentally prepare themselves for contact with potentially violent subjects. The Take A.I.M. (awareness, image, and mind-set) technique consists of officer self-initiated activities that may mitigate the possibility of assault. Officers should be responsible for their own safety; project a neat, clean, and professional image; convey that they are alert, prepared, and formidable opponents; take training seriously; and adhere to safety procedures. The Take A.I.M. pamphlet, along with the studies cited, can be found on the Law Enforcement Online LEOKA Special Interest Group (SIG) website at http://www.leo.gov. 1 A.J. Pinizzotto, E.F. Davis, and C.E. Miller III, U.S. Department of Justice, Federal Bureau of Investigation, Violent Encounters: A Study of Felonious Assaults on Our Nation’s Law Enforcement Officers (Clarksburg, WV, 2006). 2 A.J. Pinizzotto and E.F. Davis, U.S. Department of Justice, Federal Bureau of Investigation, Killed in the Line of Duty: A Study of Selected Felonious Killings of Law Enforcement Officers (Clarksburg, WV, 1992); A.J. Pinizzotto, E.F. Davis, and C.E. Miller III, U.S. Department of Justice, Federal Bureau of Investigation, In the Line of Fire: Violence Against Law Enforcement (Clarksburg, WV, 1997); and Pinizzotto, Davis, and Miller III, Violent Encounters: A Study of Felonious Assaults on Our Nation’s Law Enforcement Officers. 3 Charles E. Miller III.